Earth’s history recorded in sedimentary stratifications. By mid-twentieth century, humans had altered the Earth to such an extent as to mark the start of a new geologic epoch named the Anthropocene, concluded an international consortium of researchers in a January issue of the preeminent journal Science. Scientists divide Earth’s 4.5 billion year history into so-called epochs or time units based on major shifts in the composition and state of the planet as recorded in distinct stratifications in rocks, sediments and glacier ice. Previous transitions from one geologic epoch to the next were triggered by either cyclical drivers of climate change, like variations in the Earth’s orbit or solar radiation, or irregular events like volcanic eruptions. The most recent epoch for example, the Holocene, spanned ~12,000 years and was ushered in by a period of interglacial global warming. Transition to the Anthropocene, in contrast, is driven by an unprecedented rate of change to the global environment caused by a convergence of three human factors: rapid rises in population growth, technological development and resources consumption, starting about 1950. So although Homo sapiensfirst emerged as a species about 200,000 years ago, it wasn’t until last century that their numbers and impact were sufficient to drive the permanent changes we now see to the Earth’s system. The study authors divide the key markers of the Anthropocene into those that are completely novel in Earth’s history and those that are not unique but long-range outliers, well outside the range of variation seen in the Holocene. Through widespread activities like mining, construction, urbanization and waste disposal, humans have created massive deposits of never-before-seen forms of geologically permanent materials that, in the broadest sense, qualify as “rocks.” These include glass, pottery, plastic polymers and concrete, as well as metal alloys where naturally occurring metals are combined to form novel ones. In just the last 20 years, we’ve more than doubled the amount of concrete ever created, enough to apply thin layer over the entire surface of the globe. The quantity of plastic being produced in a year is now equivalent to the combined weight of all humanity. Plastics are resistant to biodegradation, so although they fragment over time with environmental exposure, even the smallest bits can persist as plastic polymer and become signature elements of sediments. Remnants of these and other novel manmade materials are dubbed “technofossils” when they become embedded permanently in geologic stratifications. 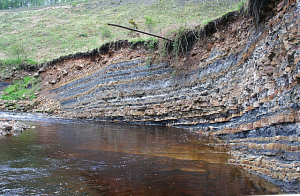 Burning fossil fuels produces airborne particles that have also contributed to stratigraphic markers in sediments and glacier ice which are unique to the latter half of the 20th century. Included are unburned particles of black carbon and tiny ash spheres formed when non-combustible materials coalesce. The fact that humans have in various ways transformed more than half the Earth’s land surface has introduced unique changes to previously natural sediments, not only on the surface but beneath it and into the oceans. Examples of man’s footprint include dams, landfills, roads, urban structures, agricultural development, deforestation, oil drilling, fracking, mining excavations, sand extraction and ocean floor trawling. Effects secondary to these activities, like soil erosion and coral bleaching, further alter sediments on land and the seafloor. In addition, the chemical makeup of sediments and ice has taken on historically unique characteristics. These include lead from gasoline, pesticide residues, increased nitrogen and phosphorous from fertilizers, industrial metals like cadmium and chromium, and polyaromatic hydrocarbons from the incomplete burning of organic materials like garbage, tobacco, charbroiled meat and fossil fuels. Furthermore, the fallout from the flurry of nuclear weapons testing between 1952 and 1964 has left distinctive isotopic sedimentary signatures. In particular, plutonium-239 is naturally very rare in nature, so its dramatic sedimentary peak in 1964 is unmistakable and will persist for 100,000 years or so because its half-life is over 20,000 years. Ice bubbles trapped in glacier ice record the gas content of the atmosphere in bygone times and reveal that, since 1850, atmospheric CO2 levels have exceeded anything seen in the Holocene. In fact, because of human activity, CO2 is currently being pumped into the atmosphere at a faster rate than at any other time in the last 65 million years. Similarly, Antarctic ice samples confirm that, by year 2000, the methane content of the atmosphere already topped levels dating back 800,000 years. The last half of the Holocene was characterized by gradual climatic cooling due, in large part, to cyclic variation in the Earth’s orbit which continues to this day. This suggests that the cooling trend should still be continuing. Instead, the anthropogenic rise in atmospheric greenhouse gases like CO2 and methane has reversed that cooling trend. By the start of the current century, the mean global temperature had risen beyond the natural variation of the last 2,000 years. If greenhouse gas emissions are not cut drastically, by century’s end the average temperature at the Earth’s surface could be the hottest since humans became a distinct species. Because of global warming, average sea levels are higher now than at any time in the last 115,000 years. Changes in sea level are recorded geologically in what are called sedimentary facies, e.g. distinctive layers of depositions in a rock wall that tell the sea level at past time points at that location. Rises in sea level predictably follow increases in atmospheric CO2 with a delay of about 10 years. Starting about year 1500, the fossil record shows a gradual increase in the rate of species extinction above the previously low background rate, with a dramatic rise from about 1800 on. Scientists predict that, if the current trends of habitat loss and exploitation by humans continue, as many as 75 percent of all current species will be extinct within a few centuries. While scientists are still discussing whether these anthropogenic alterations to the stratigraphic record are sufficient to qualify the Anthropocene as a new formal epoch, we’re aware that humans are uniquely endowed with the imagination and tool making skills to transform wild environments into unnatural landscapes like high-rise cities and shopping malls. But sadly, none of the stratigraphic signatures we are leaving behind suggest that the changes being made to the global environment are, in the long run, good for other species, or even our own. However, we are only at the very start of the Anthropocene. Hopefully we will find the wisdom to harness our unique brain power to imagine a healthier and more sustainable trajectory for the global environment than the one we are on thus far.